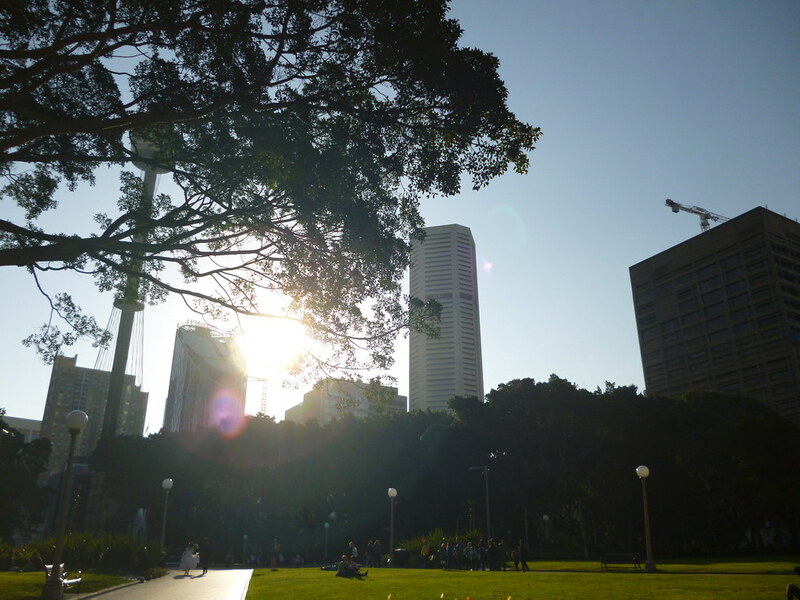 Last Sunday I spent a couple of hours in the city, taking advantage of another beautiful sunny afternoon. 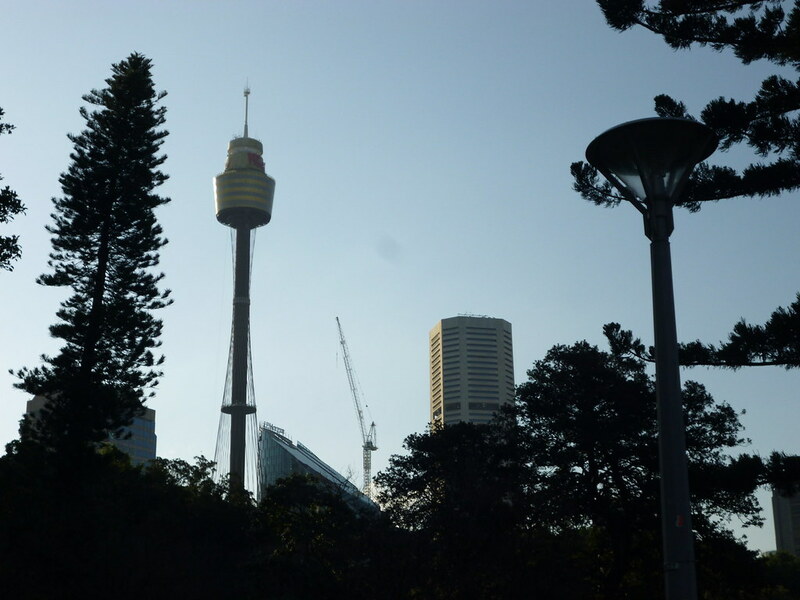 Instead of shopping, which I would normally have done if I wasn’t seriously saving money, I went for a walk in Hyde Park and the surrounding areas. I borrowed this dress from my sister and I absolutely love it. She bought it in Topshop on a recent trip to the UK and it is totally my style! 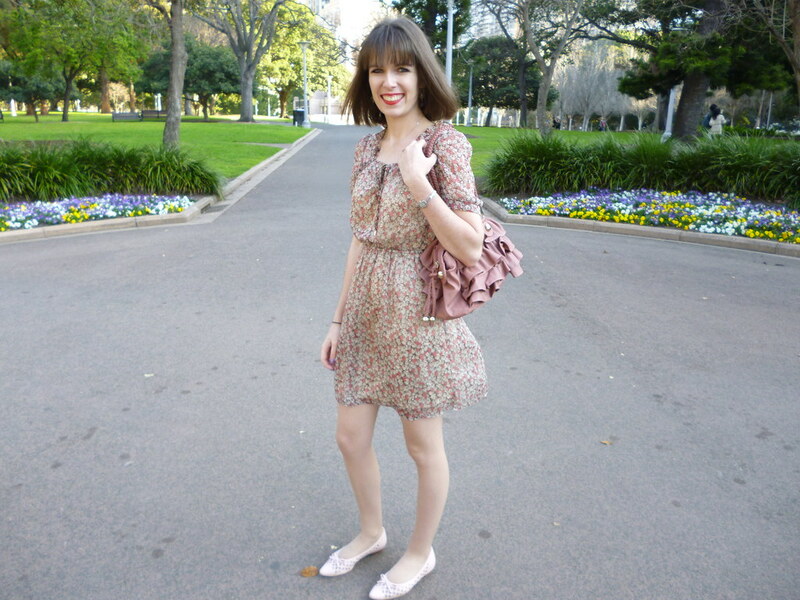 My ruffle bag is from Forever New which I displayed here. I have used it extensively in recent weeks and it is probably my favourite every day bag at the moment. In my last couple of posts I have briefly mentioned my plans to save money for the future and to stop buying clothes and shoes. For me, this is an extremely difficult task because fashion and shopping are my interests and form such a large part of my life. 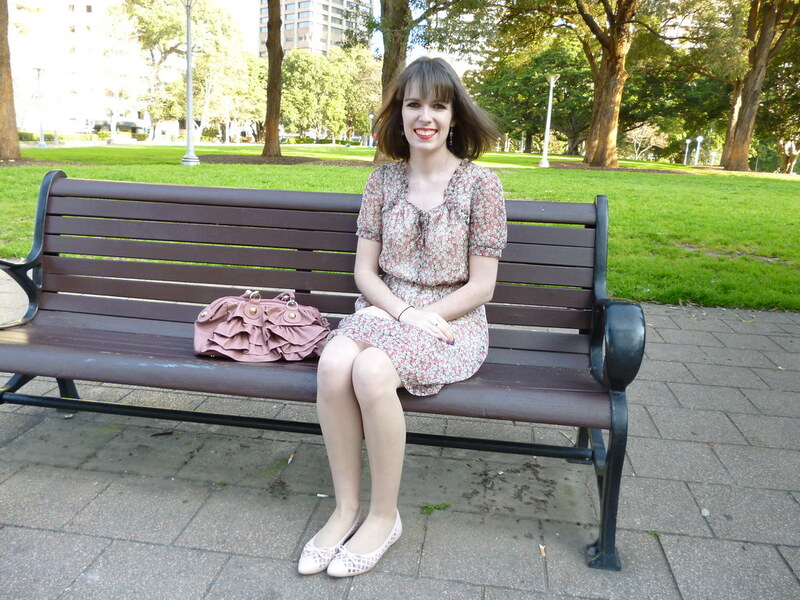 The prospect of dressing up usually provides me with motivation to get up for the day and buying a new dress or pair of shoes never fails to lift my mood. In the past I have relied on shopping and material items especially when I have felt depressed or anxious to temporarily distract myself from the realities of life and to create my own little world where I felt happy. I know this wasn’t the best way to live but for me, it provided short term benefit and it worked. Now, four years out of school and with only a little more savings in my bank account than when I was 18, I regret it. I wish I had been more sensible with money and that I could be living my dreams now instead of in the next couple of years. I wish I had known back then what I know now. However, I am aware that life doesn’t work that way and it is only now, at 22 that I feel like I have grown up and have a greater understanding of what I want from my life. Next year will be extremely busy for me because, along with getting married and attempting to finish my law degree, I have decided that I want to purchase a unit with Rydog in a particular suburb in Sydney. This is a rather ambitious goal but realistic at the same time if I stick to my savings plan. We have even started to look at the real estate market because it is never too early to start. I am so incredibly excited about my potential new lifestyle and having goals, aspirations and life direction has made me feel much more positive about myself and life in general. I just have to keep focused because I am the most impatient person ever and always in such a rush to get on with my life. I feel that having a very specific goal provides me with the motivation to save money and I don’t feel as much of an urge to spend. It will take time to completely transform my spending habits and the way I view shopping but I am very pleased with the progress I have made so far. I also believe there will still be room in my life for fashion and new items. Instead of buying clothes I will continue to customise some of my existing pieces, become more creative with what I have a possibly make the occassional skirt. I know I can reach my goal next year and I won’t let anyone stand in my way!! 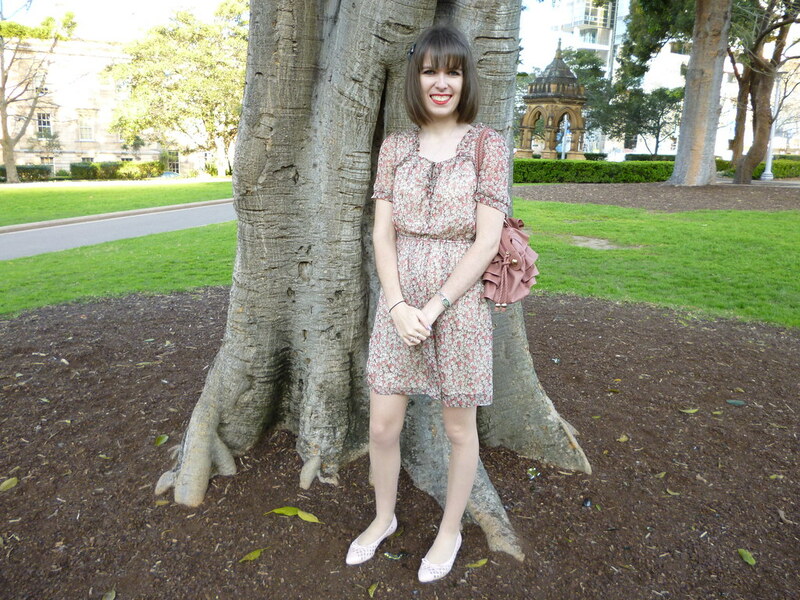 This entry was posted in Forever New, Outfits, Topshop, Wittner. Bookmark the permalink. Good for you it's so good to have goals and dreams to aim for!!!!! the dress is just how i imagine the perfect dresses for you. romantic and girly 🙂 i love! That dress really suits you well. It looks like youve been having some nice sunny days like we have too. It is so much easier to save when you have such important goals to work towards. Mikey and I are moving out on Monday to a sweet little rental property and after weve bought all the furniture, whitegoods etc we will be saving hard for our wedding which is also next year (November hopefully, when is yours???) and then saving to buy a place of our own. Ive cut down on buying clothes, but I dont think theres anything wrong with buying the odd piece of new clothing. The Topshop dress is fabulous! You look great! You look lovely in that outfit and I absolutely ADORE your purse. It's beautiful! I wish you the best of luck on your shopping ban and savings plan. I have no doubt you can do it. You are very smart and make very rational decisions. 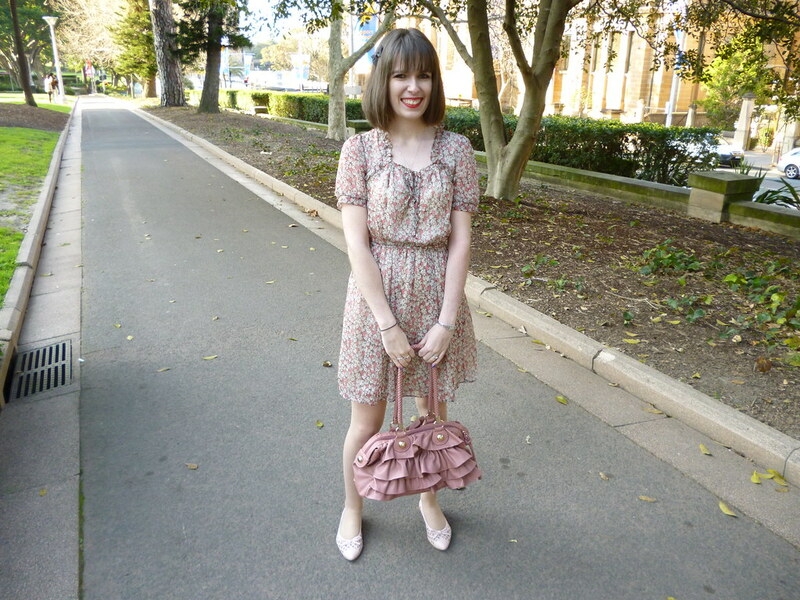 very cute flowered dress… those flats are amazing. good luck with your future goal! I also plan to have my own place in next two years! 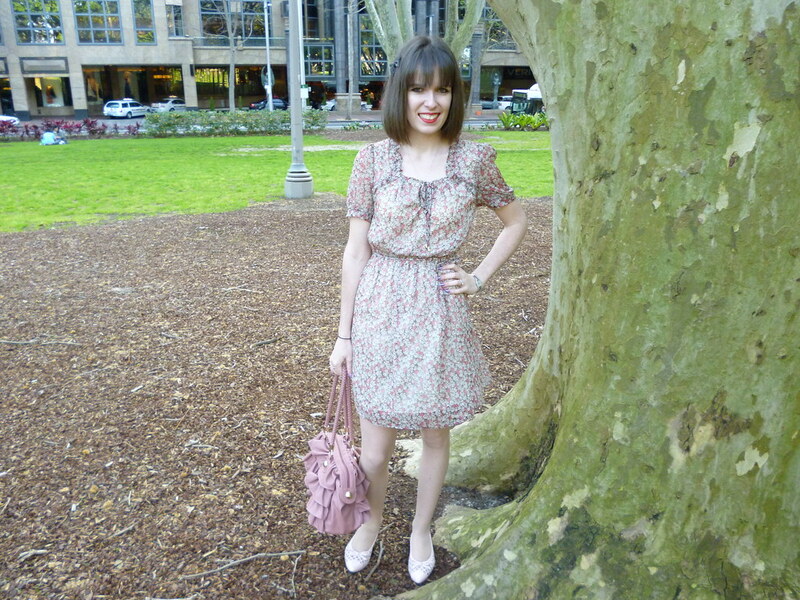 What a fun, flirty dress. The colors are so pretty on you! lovely photos! that dress is so cute! love the bag! The dress is so cute. Good luck with your new life, your wedding and your saving plan 🙂 This outfit is so pretty. If you wanted to continue to buy clothes, you could shop in second hand stores and thrift stores.. there are definitley some bargains to be found! I can hardly believe that you are still 22, I am almost 25 now and still hunting for that first job- it's crazy! You look lovely by the way, that dress is lovely and how great is it that you guys share clothes? I rarely wear anything belonging to my sister, how styles are so different! 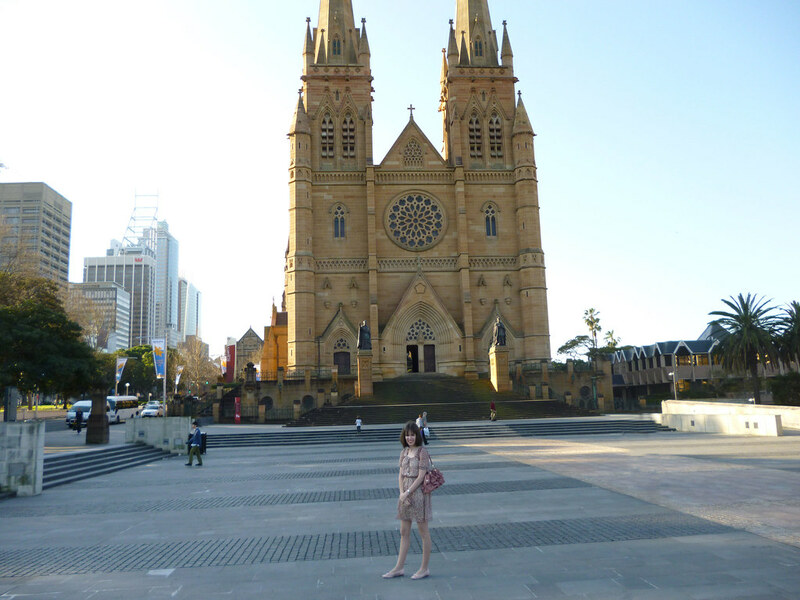 I love your pretty, feminine outfit and the backdrop of that church is gorgeous!